Fracturing Britain: the end of the United Kingdom? Last year’s 2015 general election revealed a Britain that was increasingly fractured between nations, between the north and south of England, and between more prosperous metropolitan and deprived areas. But GE2015 has now proved to be only a staging post in the UK’s splintering. The momentous vote for Brexit in last week’s EU referendum threatens economic and political turmoil, and it may effectively split the United Kingdom. The results show stark geographical divisions. Outside of London and its affluent hinterland, as well as inner cities such as Manchester, Liverpool and Bristol, England has voted for Brexit with a majority of 1.9 million (53% to 47%) voting to leave. Wales also voted for leaving the EU (despite being by far the highest UK beneficiary of EU funding) by 52.5% to 47.5%. Northern Ireland voted to remain by 56% to 44%, but is split between unionist and nationalist areas. Meanwhile Scotland has a strong majority to remain overall (62% to 48%), and a local majority to remain in every single local authority. The case for Scottish independence to prevent its undemocratic removal from the EU is inescapable, unless some kind of ‘reverse Greenland‘ compromise can be reached. Data from Electoral Commission. Shapefile comiled by Robin Edwards (@geotheory) and Alan McConchie (@mappingmashups). Underlying the geographical divisions are a host of socioeconomic factors, including education levels, income, unemployment and deprivation: in other words populations that have been cut off from the unequal benefits of globalisation have overwhelmingly voted out. The demographics of this outcome have been reviewed in detail in the Financial Times, or try the excellent John Harris reporting the UK’s inequalities. One of the saddest divisions in the referendum is age, with 75% of votes under 25 and 58% of voters aged 25-34 voting to stay in the EU. Young Brits are now set to have the opportunities of freely living, working, studying and cheaply travelling in the EU made much more difficult due to older generations. The referendum came about as a Conservative manifesto commitment to address deep internal party divisions and appeal to right wing voters. This gamble has spectacularly backfired, forcing the prime minister to resign. However another critical factor in the result has been the Labour leadership’s mixed attitudes to remaining in the EU. Traditional Labour areas in England, including the North East (58% leave), Yorkshire and the Humber (58% leave) and West Midlands (59% leave) voted decisively to leave the EU. Labour’s uncharismatic leader Jeremy Corbyn has failed to make an impact during months of civil war by the Tory government, and ran a lacklustre campaign for remaining in the EU, despite the economic impacts of Brexit (currency devaluation, inflation, higher prices, more austerity…) set to hit poorest families hardest. Another way to look at this is if we select local authorities that coincide with Labour won seats in the 2015 general election. We can see that there are a majority of Labour heartland areas that voted to leave the EU (51% of voters in the map below). Indeed if we discount London, the majority for leaving is 55%. This highlights the degree of disconnect between the remain campaign and Labour heartlands. While the short term economic and political impacts of Brexit are already underway, the full implications will not be known for years both within the UK and beyond. During the referendum, the negative predictions of a Brexit were dismissed as scaremongering. We will now find out if this is the case, with jobs, the union, and the future of the UK and the EU on the line. Get the data on the EU ref results- Electoral Commission, GIS File (thanks to @geotheory and @mappingmashups). 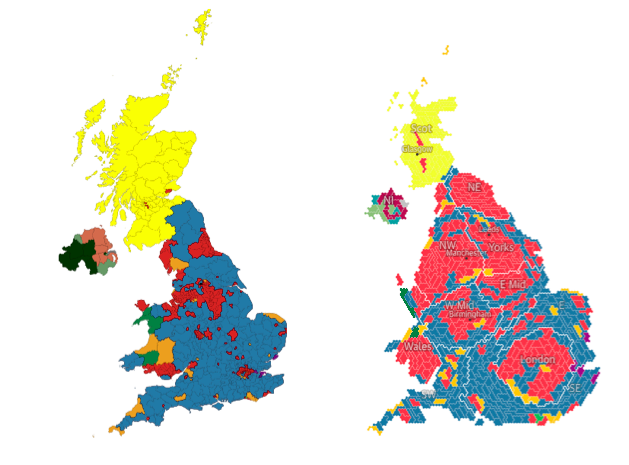 2015 General Election predictions from May2015.com (left) and Guardian (right) in cartogram format. How can we understand this changing political geography? There is a strong tendency towards spatial clustering of similar voting patterns, with votes for minor parties higher further away from the economic and political core of London. This relates to the nations of Scotland, Wales and Northern Ireland but also to regions like South West England and coastal towns where UKIP and the Greens could pick up seats. 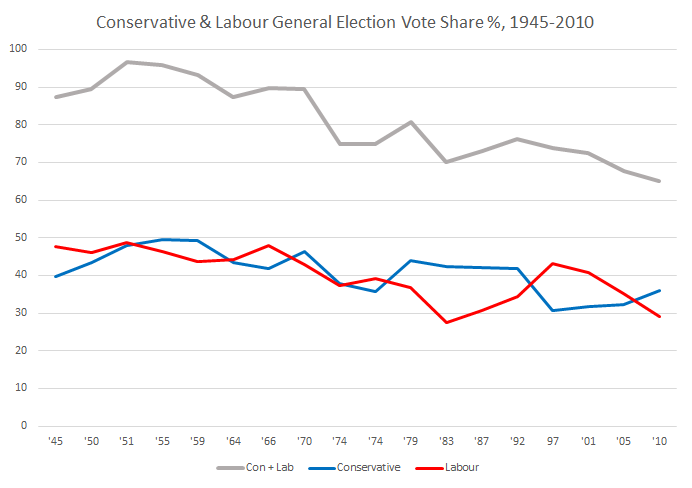 There is also a strong geographical element to the division between Labour and Conservative seats, with Labour strongly urban and northern while Conservatives are dominant in more rural areas and in the South East. These various levels of percolation clusters can be viewed as a tree (below). 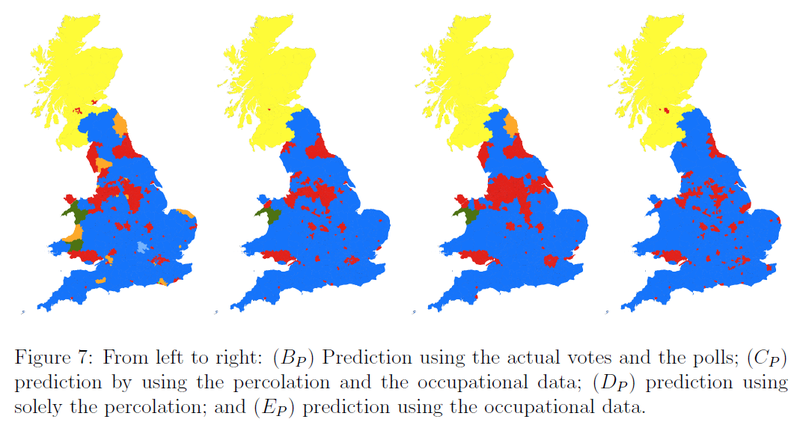 Our question is then, do these regions generated through percolation analysis bear any relationship to voting patterns? We can test this by classifying parliamentary constituencies according to the composition of percolation clusters that fall within each constituency. Each of the parliamentary constituency groups is assigned an ‘average voting behaviour’ from the real voting behaviour in 2010, in terms of a vector of percentage votes for each of the parties. The average voting behaviour of each group can be compared to the real voting behaviour in terms of the percentage error. We can compared the percolation clustering outcomes against results using different datasets. 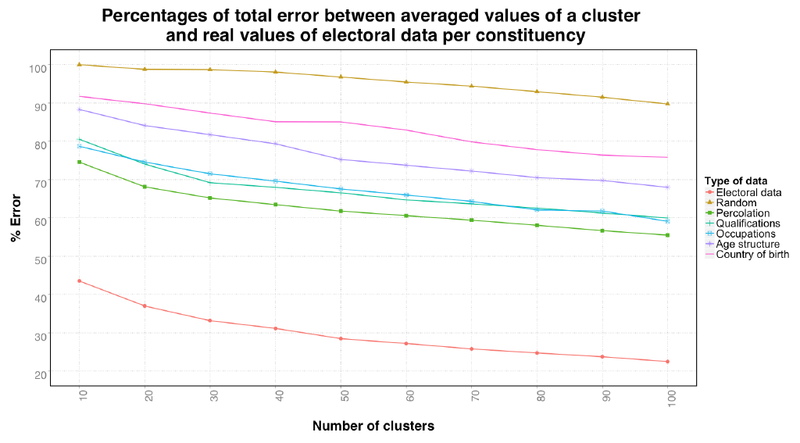 Clusters created using the real voting data naturally produce the lowest error. It is interesting however that the percolation based results outperform clusters produced using common socio-economic data such as socio-economic class, age and education level. In terms of the total seats predicted, the results are not too far off current polling predictions. The percolation based method tends to exaggerate Labour’s predicted number of seats, as Labour benefit from a strong clustering of their vote in northern city-regions. 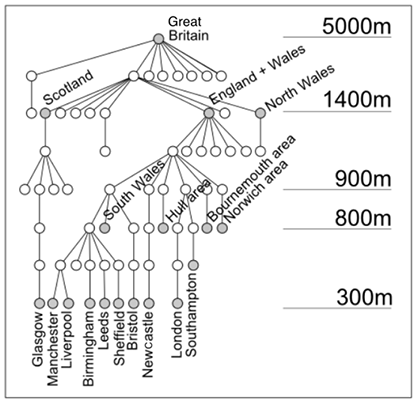 Overall the percolation method is very a promising approach for understanding regional divisions in the UK, and we continue this line of inquiry in further research. It remains to be seen whether the political geography of the UK will continue to fracture further along these regional lines. A key factor will be whether the rise of smaller parties raises the pressure for voting reform, as the First Past the Post System is becoming increasingly misrepresentative of the UK’s voting patterns and is failing to deliver the single party majority that is supposed to be the FPTP system’s main asset.